Hi cuties! So, one of my main 2019 goals is to bring you guys closer into my hair journey. It’s something so many of you have asked since I went natural last year and I’m excited to finally have some experience to share! When Pantene reached out and asked me to join their 14 Day Challenge I thought - perfect timing! For background, I hadn’t tested any of their natural hair products since starting my journey, which made this challenge even more exciting as I’d be starting on a fresh, new canvas. To be completely honest, my expectations were not the highest on day one. Not because I didn’t have faith in the product - on the contrary, I had heard great things! I just wasn’t too sure how much my hair could *actually* change in 14 days. Boy was I wrong! 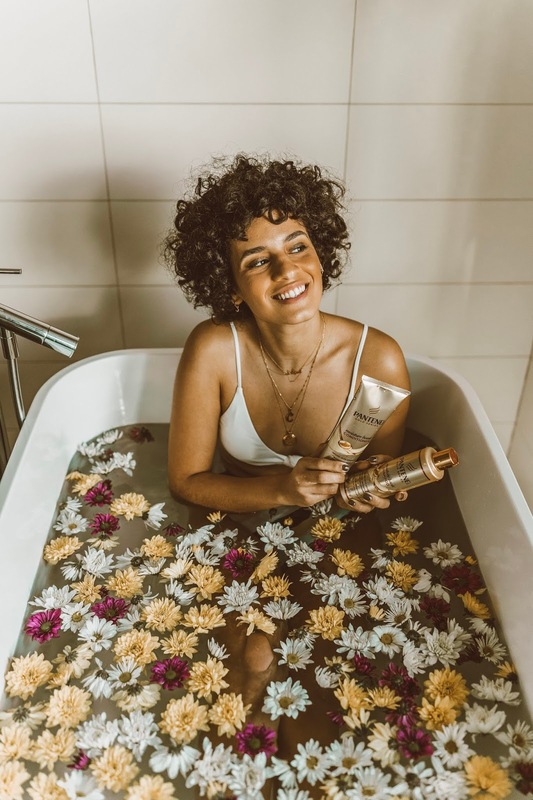 The Pantene Gold Series Collection is described as “designed to provide strength and moisture for women of African Ancestry who are relaxed, natural or transitioning hair.” As a Latina who checks all the boxes, I was intrigued! The line offers a number of products - for the purpose of this challenge I tested the Shampoo + Conditioner and utilized the Curl Defining Pudding from time to time. A few more product details: Each product in the collection is powered by Pro-V nutrient blends, protective conditioning and repair agents formulated to work together to improve moisture, strength, elasticity, smoothness and shine. The collection is infused with Argan Oil, which offers a number of hair health benefits - such as treating split ends and taming frizzy hair. The conditioner is sulfate-free, paraben-free and dye-free, while the shampoo is just paraben-free. Prior to accepting the challenge, I shared that I had been battling a serious case of winter dandruff that I was hoping to eradicate or at least make some headway. I tried a number of different hair routines with little-to-no progress, so I was really hoping to see some change here. Secondly, since going natural I’ve noticed that my hair has progressively gotten drier and stiffer. All things I had hoped to turn around using the Pantene Gold Series Collection. The first thing I noticed when using the products for the first time was the amazing smell! The shampoo lathered fairly quickly and felt as though it was thoroughly cleansing my hair without stripping it. What happened next was HUGE: the conditioner. OMG you guys the conditioner is LIFE-CHANGING. It literally makes the detangling process a breeze. I have a lot of hair and so conditioning can take a long time. I swear I was done conditioning in no time and noticed less shedding... Guess if you’re not playing tug war with your hair it happens to stay where it’s supposed to! I’m happy to share a big, curly YES! I mean, even as early as my 7-day check-in I was shooketh. The first thing I noticed was the decline in dandruff - something I hadn’t been able to solve in months! Additionally, my hair was visibly (and physically) way softer and easier to style. As most of you know, I use flexi rods to achieve my curls as I’m still transitioning. This means I have to comb my hair out every other day, more or less. I’d say mid-first week I noticed how much easier it was to do this thanks to how much more manageable my hair had become. I’d say my hair is way more moisturized, as well. Even my mom called me to comment on how much shinier my hair looked on Instagram stories! All in all, I have to say I was so wrong about the 14-day thing. With Pantene’s Gold Series Collection, it is 100% possible to achieve results in such a short period of time - I’m living, walking proof of this! But it doesn’t end there - or not for me at least. I’m excited to continue using the products and tracking the progress as I nurture my curls to health. Listen, the bottom line is that going natural is not a walk in the park. It’s not all rainbows and perfectly bouncy curls, all the time. It’s hard work and there will be times where you’ll want to quit. So, whenever you can find a product that helps make this journey just a tiny bit easier and it’s accessible, I swear it’s the natural hair Gods’ sign! Thank you, Pantene for inviting me to participate in this challenge and allowing me to share my experience with my audience. This post is sponsored by Pantene - however - all opinions are my own...TRUST!